At 13 years old, CEO Andrea Cao wanted to create an easy, affordable, and effective solution to muscle pain. What started as an invention to help her mother quickly turned into a nationally loved tool after she pitched it on ABC’s Shark Tank. In 2014, Sharks Mark Cuban and Barbara Corcoran invested in her product, transforming it from a door-to-door operation into a legit company. 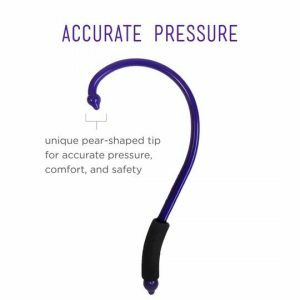 The Q-Flex is a multi-use acupressure tool that’s designed to alleviate muscle pain. From sports recovery to knots from an office job, we got you covered with the greatest acupressure tool in the universe. The Q-Flex can be used on your feet, upper & lower back, legs, neck, and more. To this day, we are proudly owned and operated in sunny San Luis Obispo, California. The Q-Flex is manufactured in the USA, fulfilling our mission to create American jobs.